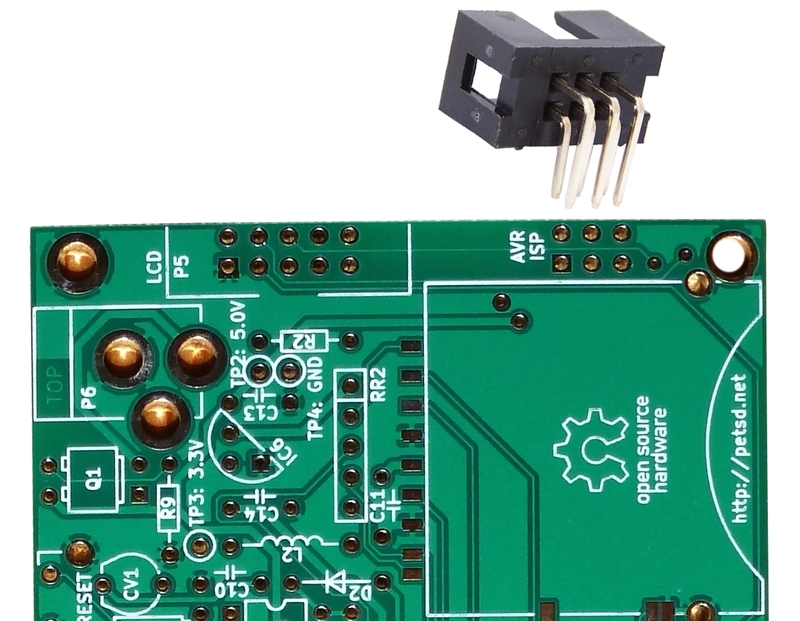 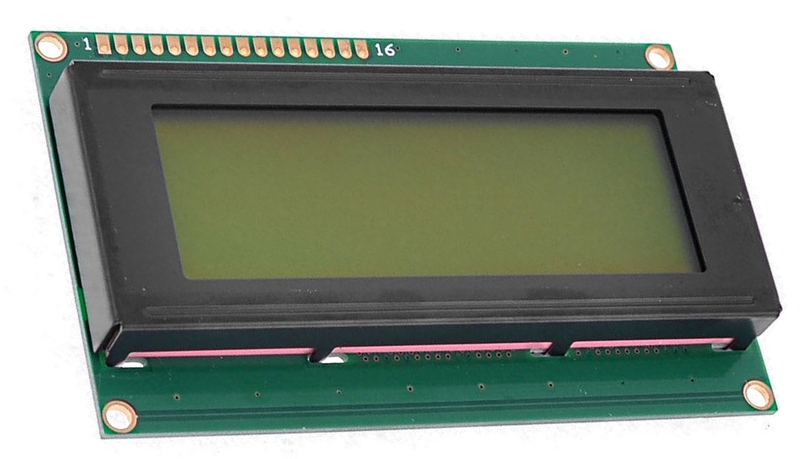 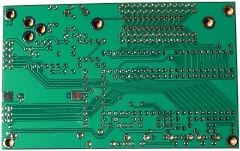 The PCB and parts list allows for the inclusion of the additional components (X1, C7 & C8) required to provide an external clock signal to the MCU as used in the design of the original petSD. 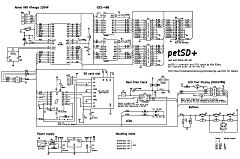 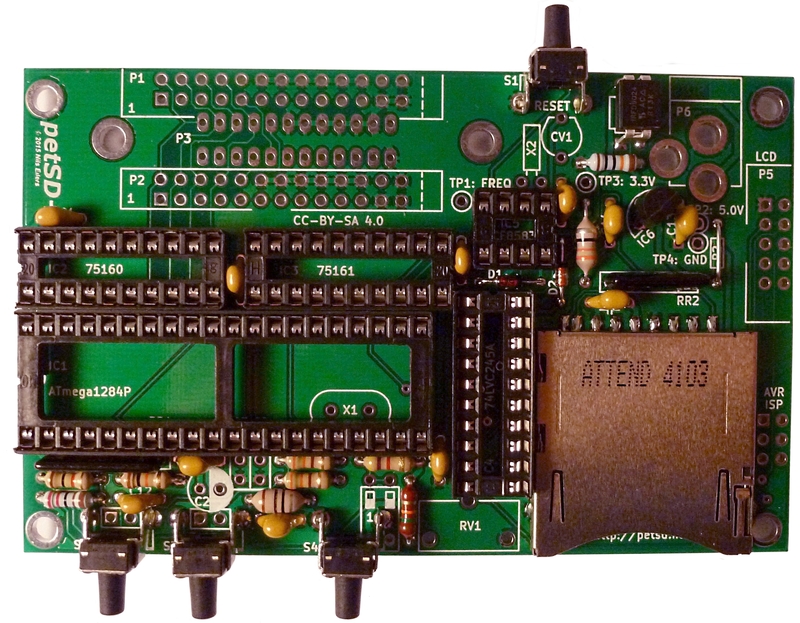 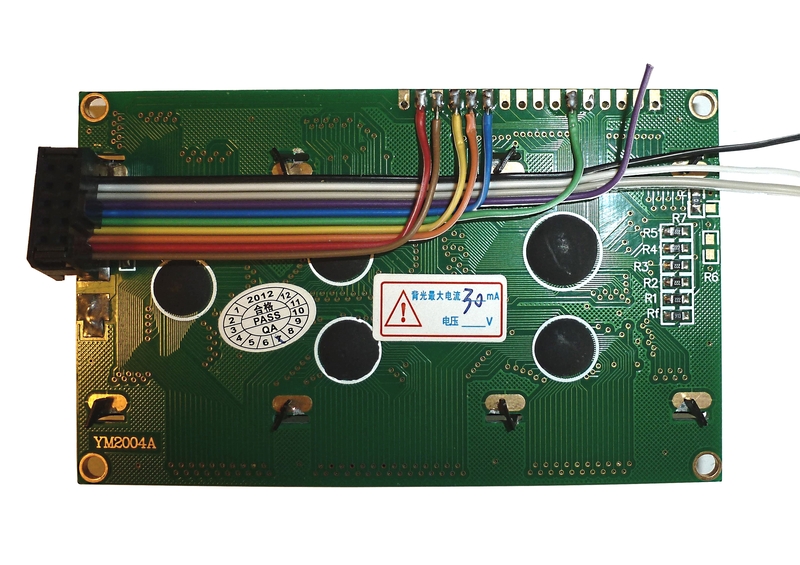 The use of an external oscillator is not required for petSD+, the recommended option is to use the MCU's internal 8MHz RC oscillator and the default petSD+ fuse map is configured for this option. 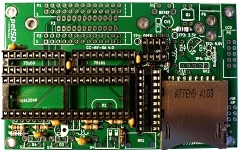 Although the external clock option could be used, the MCU fuse map would need to be modified, which cannot be done using the boot loader and would require the use of an MCU programmer. 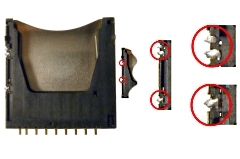 In view of this, the petSD+ parts kits will not include X1, C7 and C8. 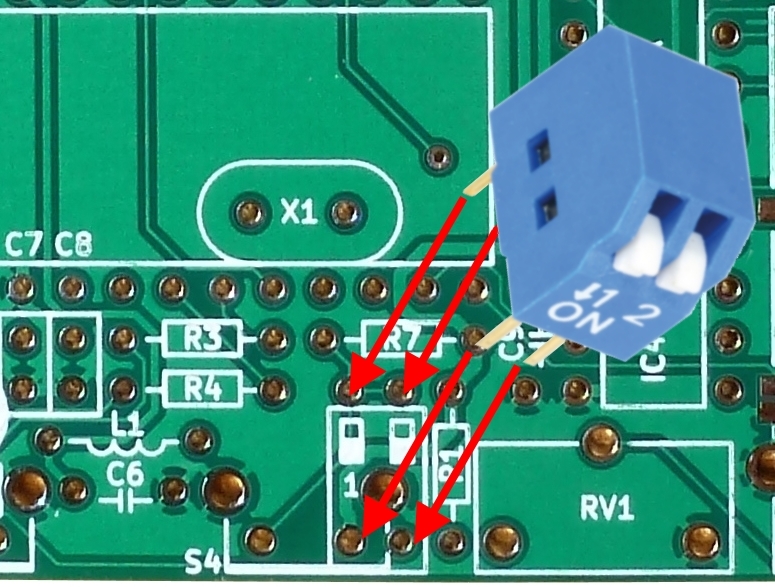 With the board being so densely populated, the original leads on the variable capacitor are too big to pass through the small holes for CV1. 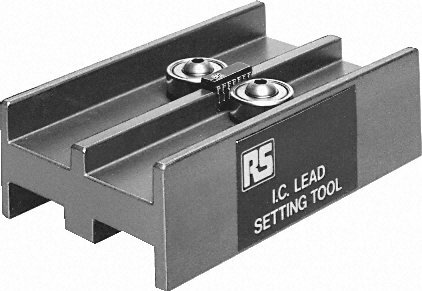 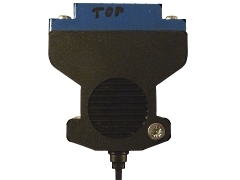 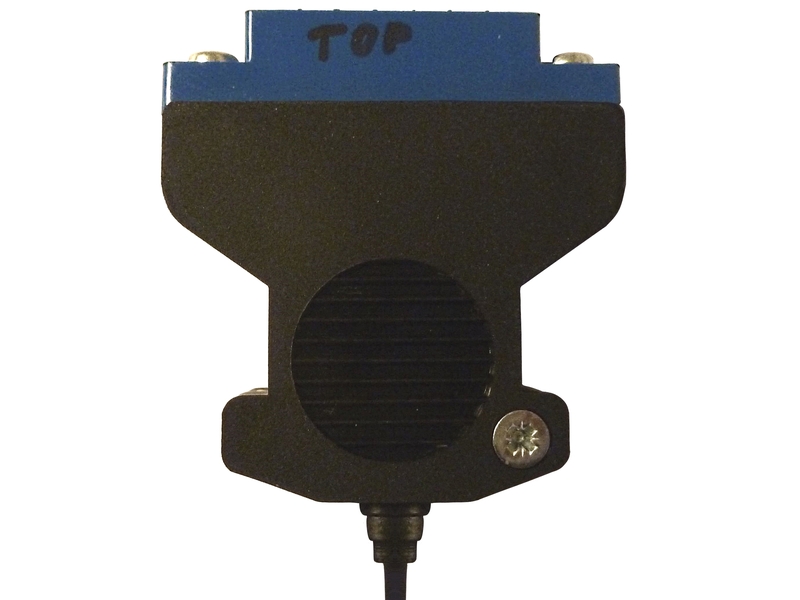 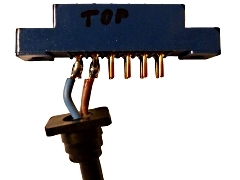 Cut off the original leads and use a couple of the off-cuts from other components that you have already mounted to make some new, thinner, leads and solder them to the vari-cap. 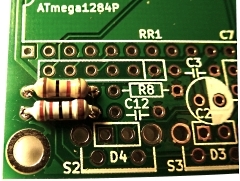 Note that one leg must be bent to match the PCB hole pitch. 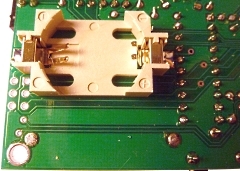 Power Connect the wires to both the upper and the lower sides. 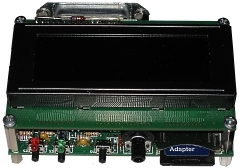 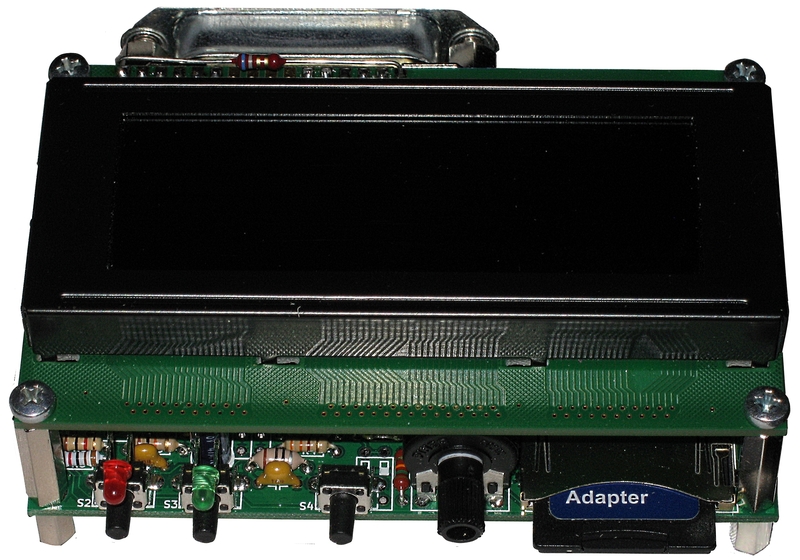 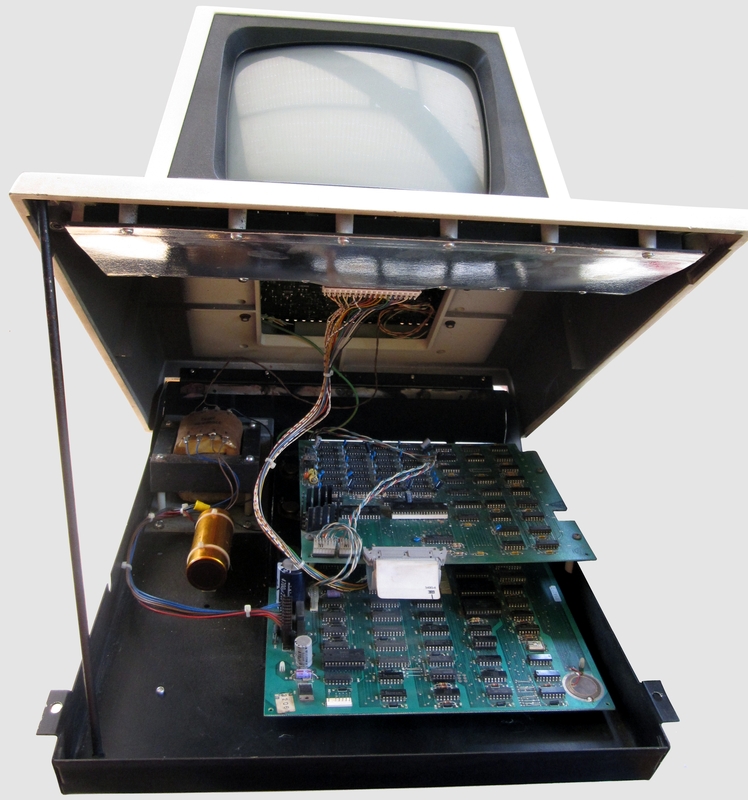 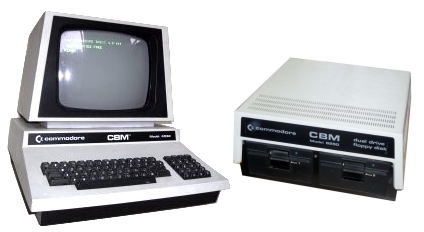 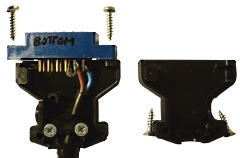 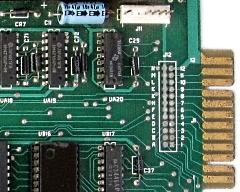 When viewed from the rear, the cassette port power terminals are at the left hand side of the connector. 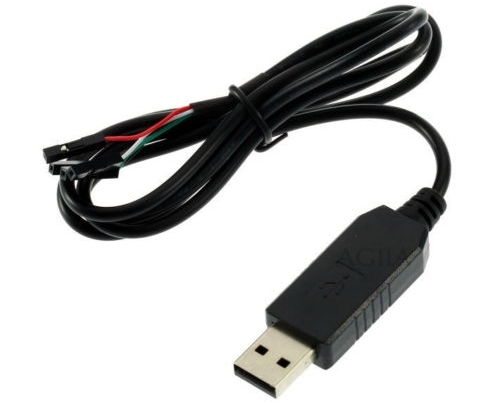 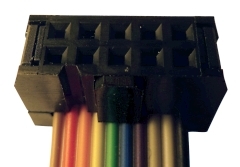 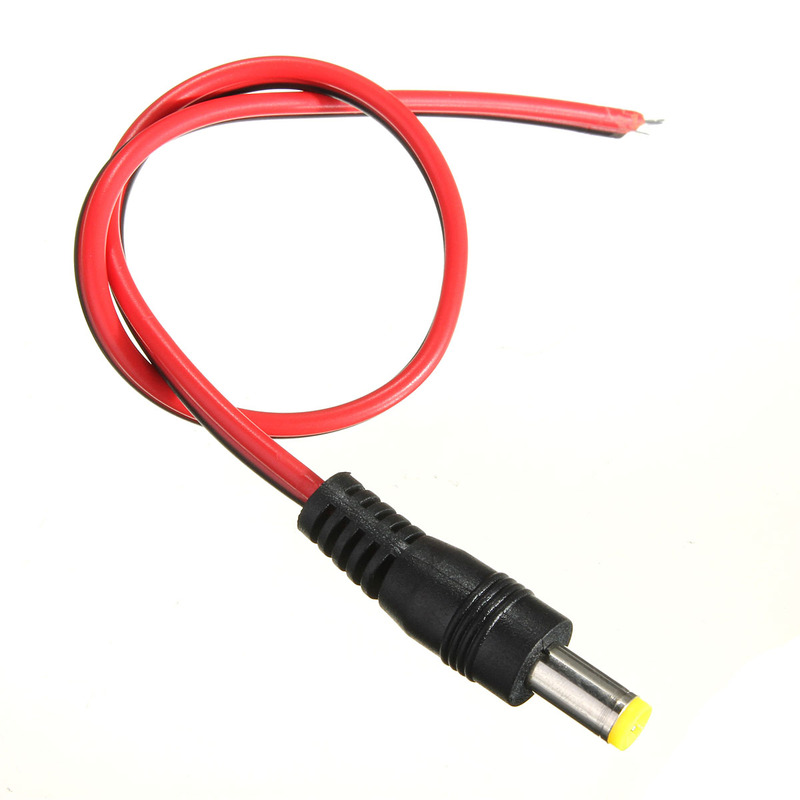 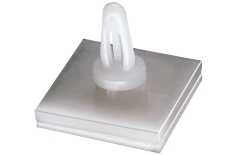 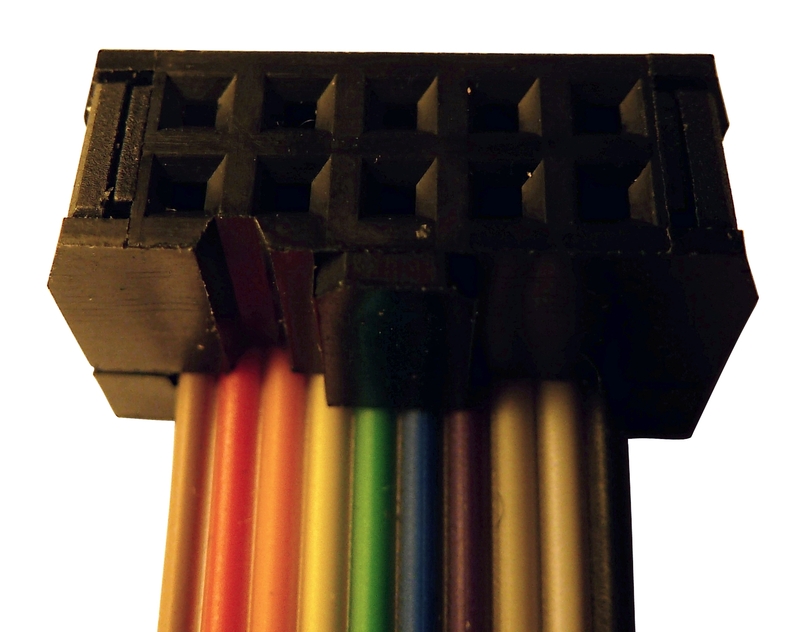 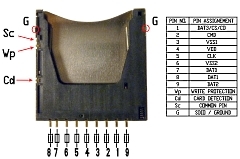 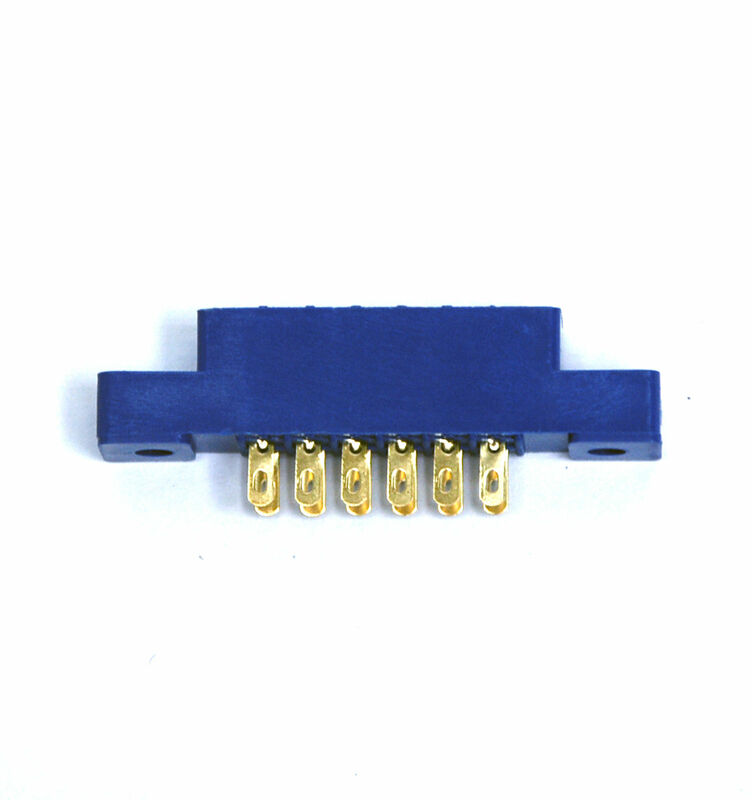 Although the PET edge connector has a key slot in it, the connector plug does not include one, either fit one yourself, or mark the connector to ensure that you know how to connect it. 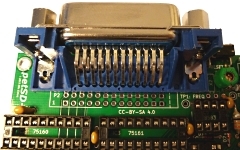 I obtained a very small number of cassette port connector covers from Nils, these have now been allocated to a few of the folks who have requested a petSD+. 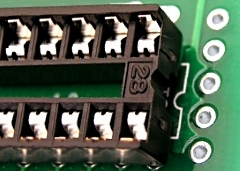 Unfortunately, although the connectors themselves are still available, I have not been able to source additional covers. 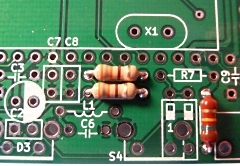 As the first power cable photo shows, without the cover, there would be no strain relief for the cable and I am not happy with the relatively heavy power cable just hanging off the solder tags so I am proposing alternative options for powering petSD+. 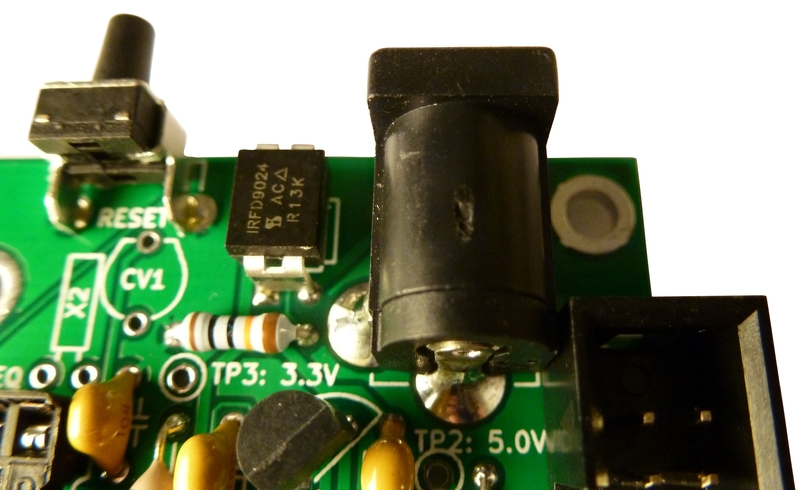 . . . .
Power The most convenient way would be to use a cheap "wall wart" AC/DC power supply with an output of >500mA at 5VDC. 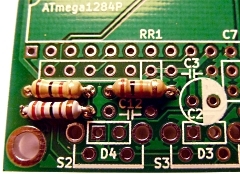 Power The PET cassette port could still be used to provide power, but I would intend to use a short length of lightweight cable - probably no longer than 1 meter. 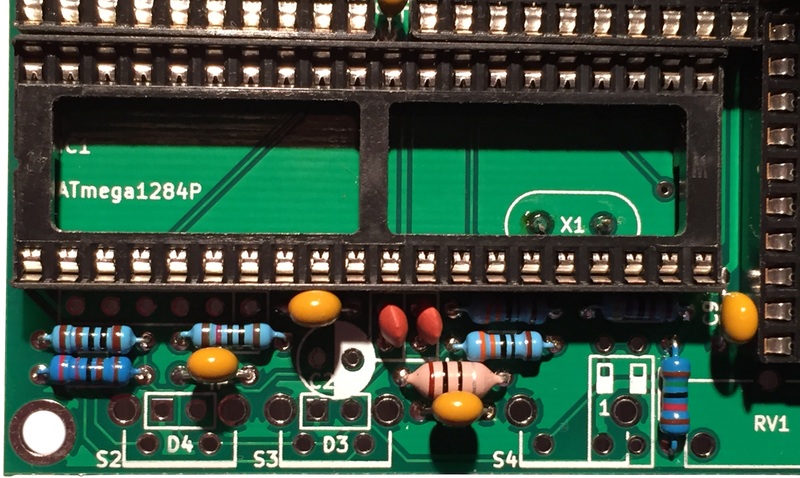 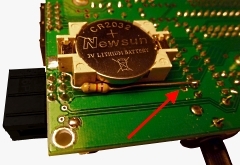 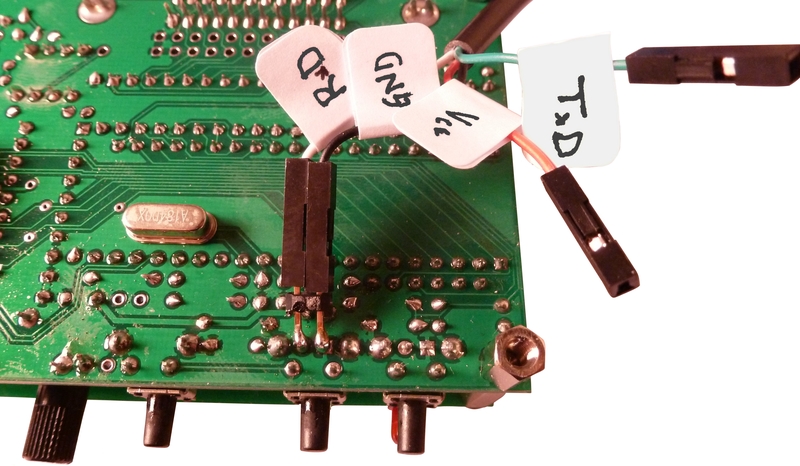 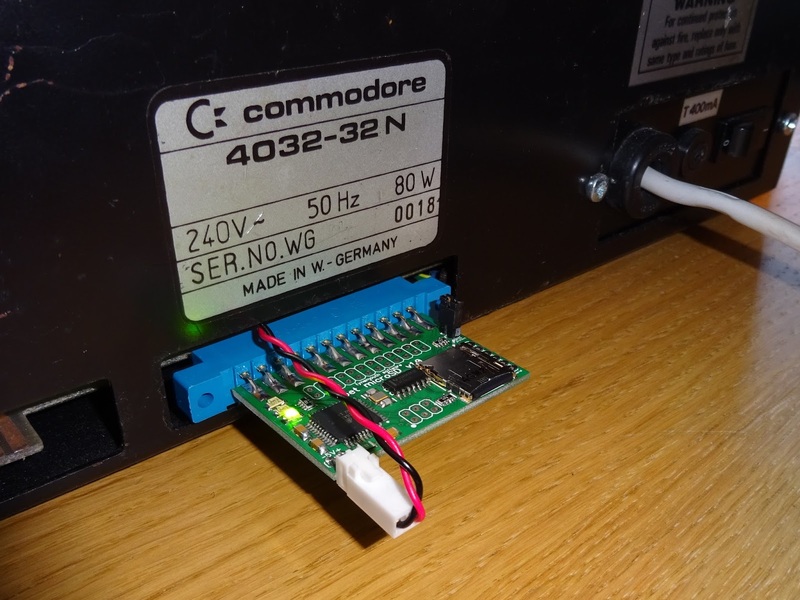 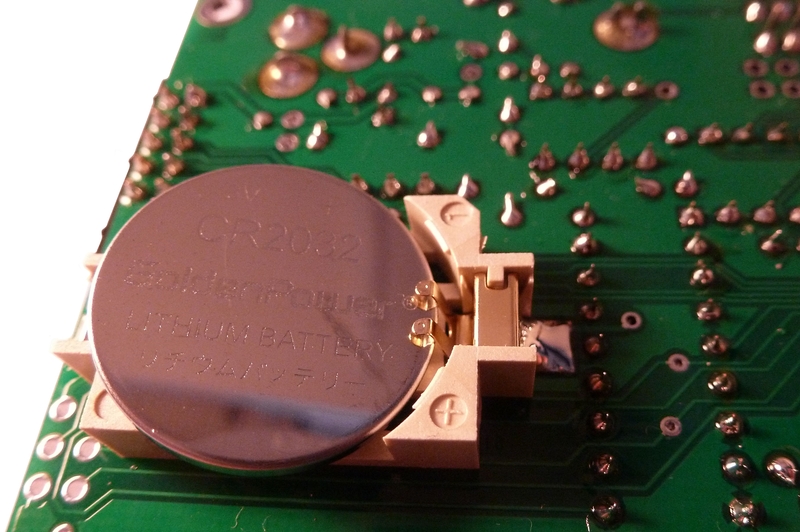 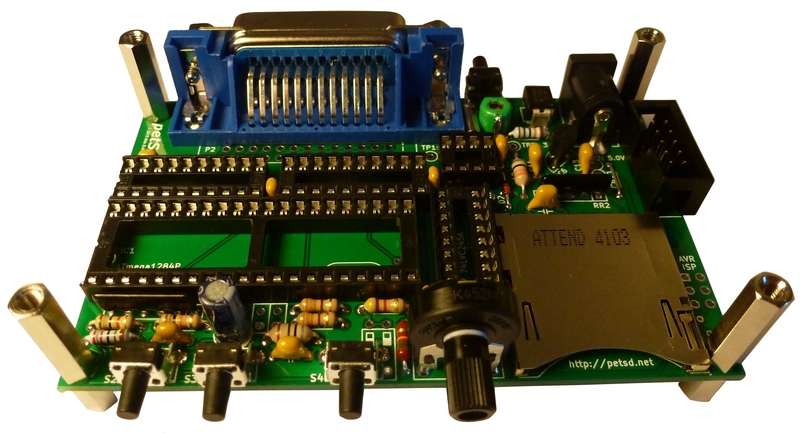 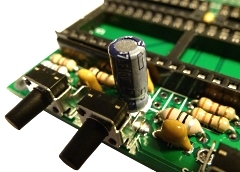 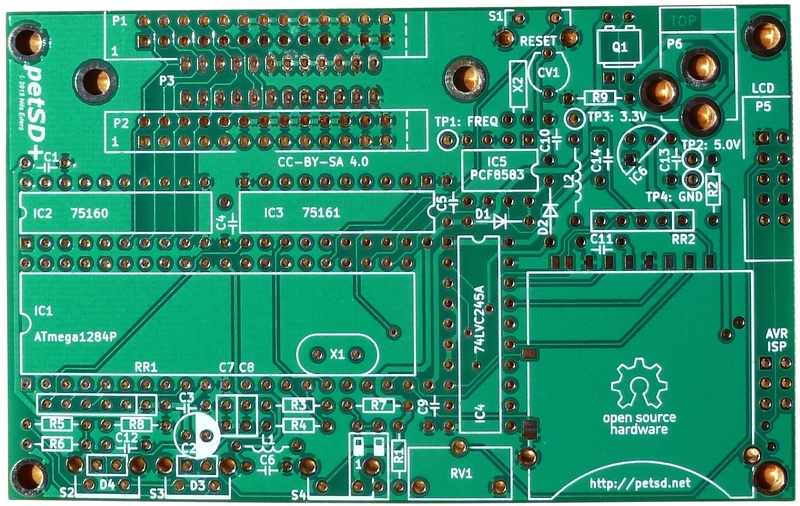 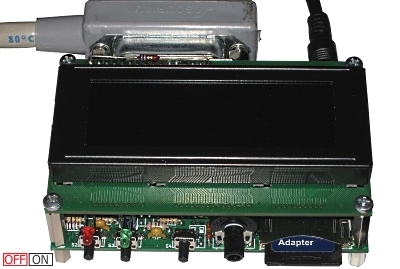 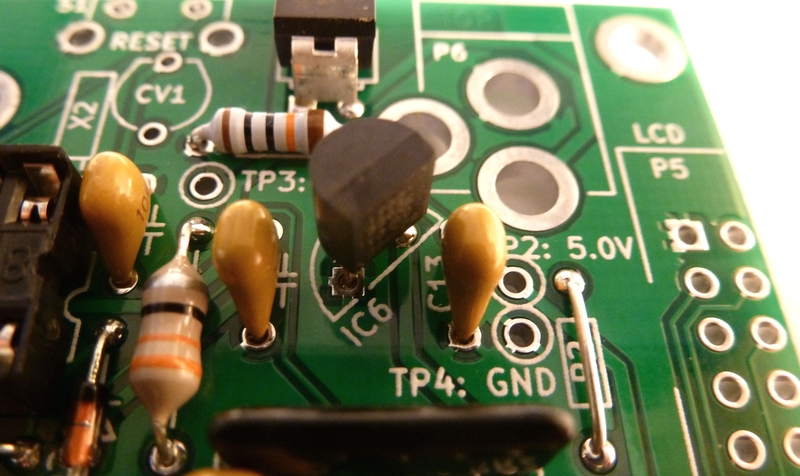 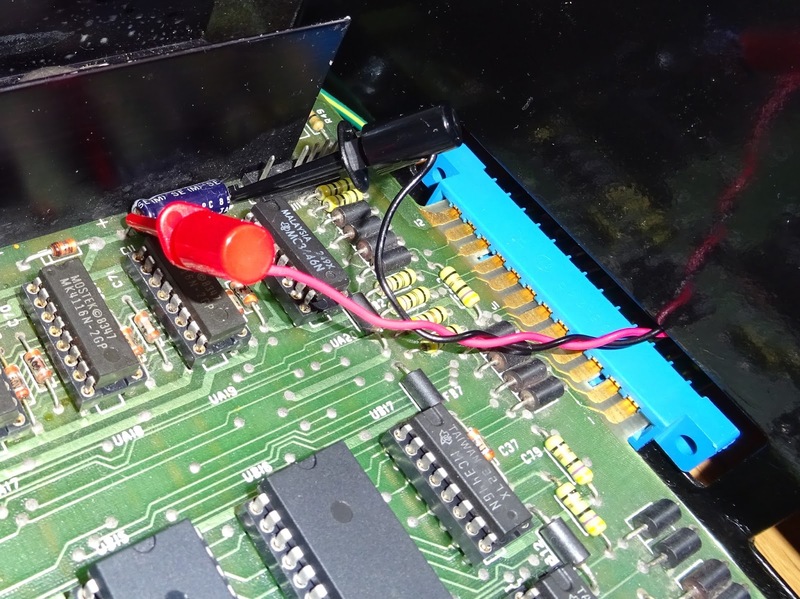 Dave Curran had the same issues with providing external power for his pet microSD and has solved the strain relief issue by designing a small board to hold the cassette port connector and power lead. 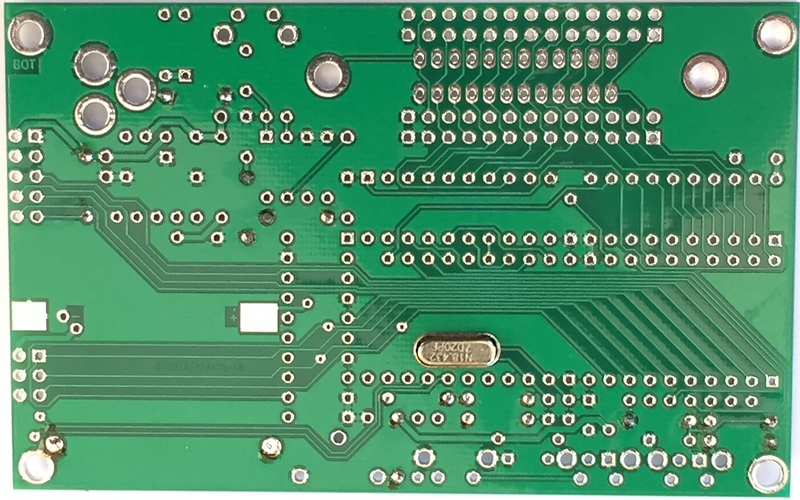 Dave has kindly made some of these boards, as well as the design files, available to me, so I am able to offer them as an option for petSD+. 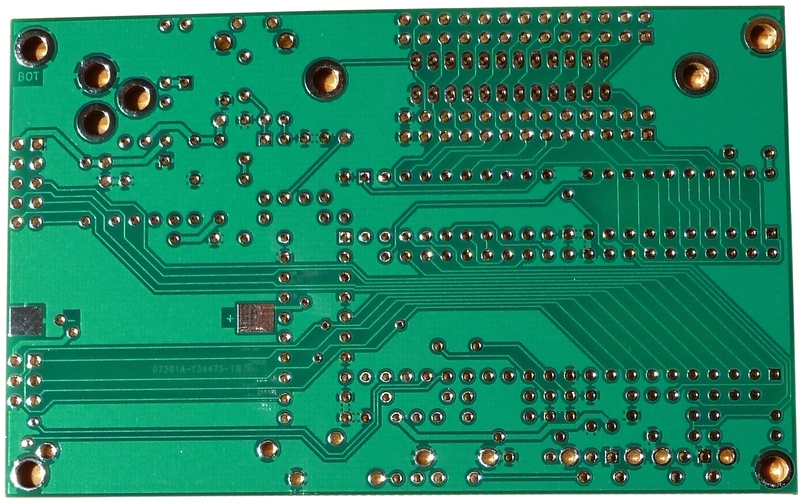 Power Dave has produced the boards in green and blue. 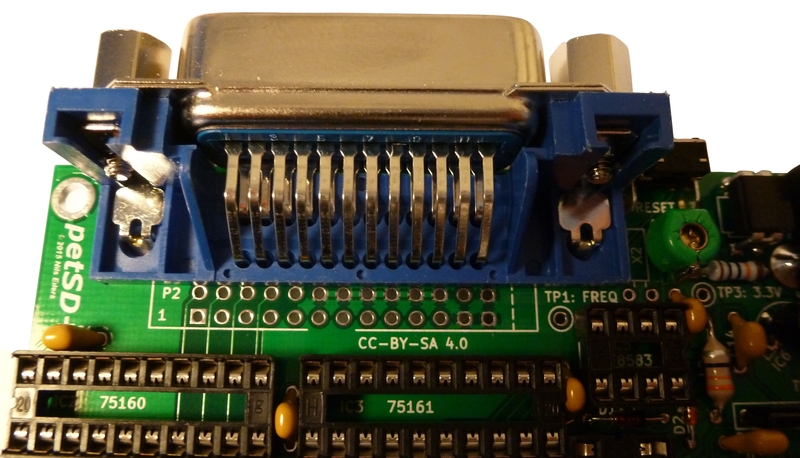 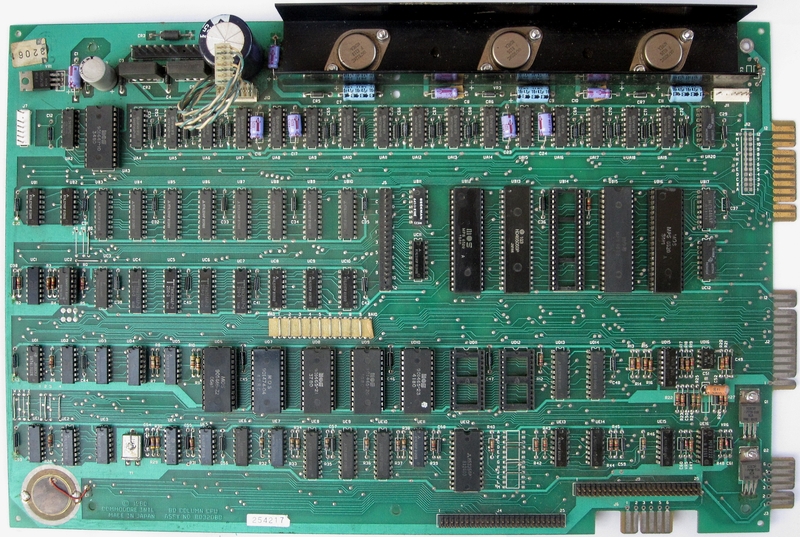 Initially, I shall only be able to supply the board in green, but, if there is a demand, I will be able to supply the boards in blue to match the cassette edge connectors that I have. 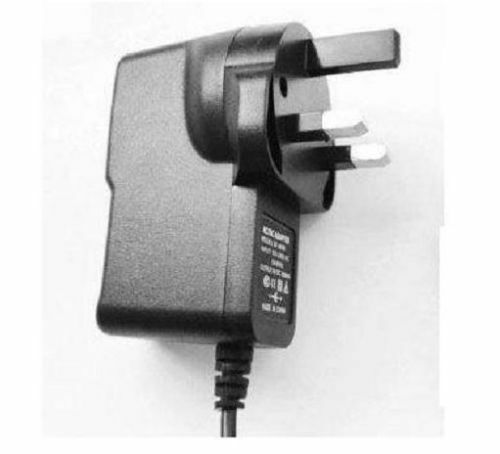 Power I will be able to supply a power cable (or the parts to make it) like the one shown here. 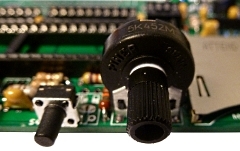 It includes Dave's cassette port board, a PET cassette port edge connector and a 1m cable with a 5.5mm x 2.1mm plug to connect to the petSD+ power socket. 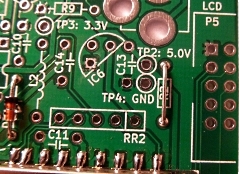 ISP As noted on Nils' errata page, the prototype design has an error in the ISP connection. 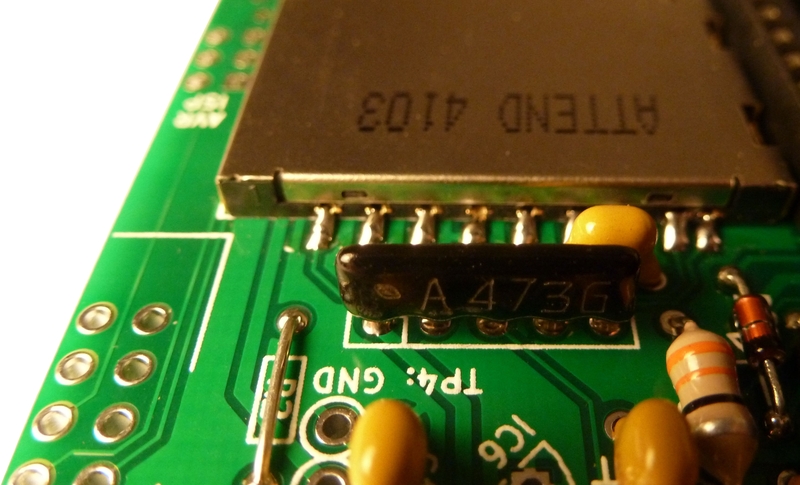 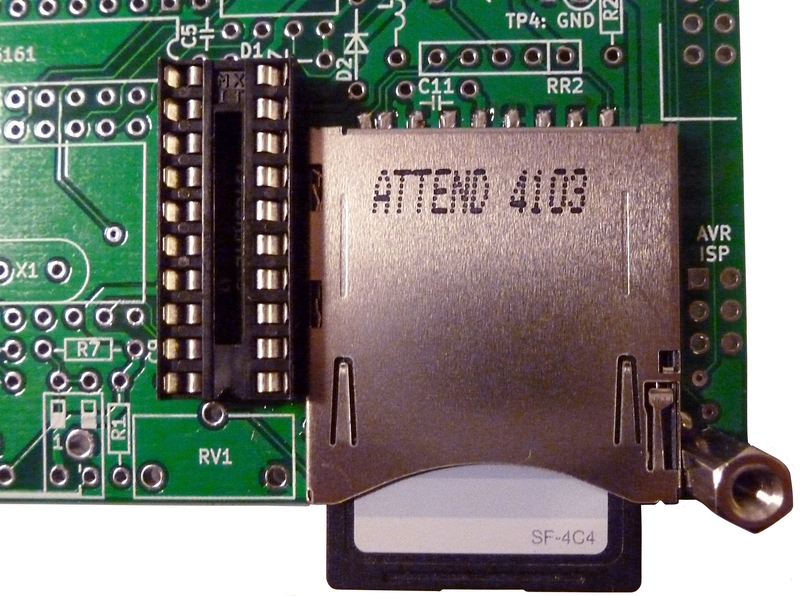 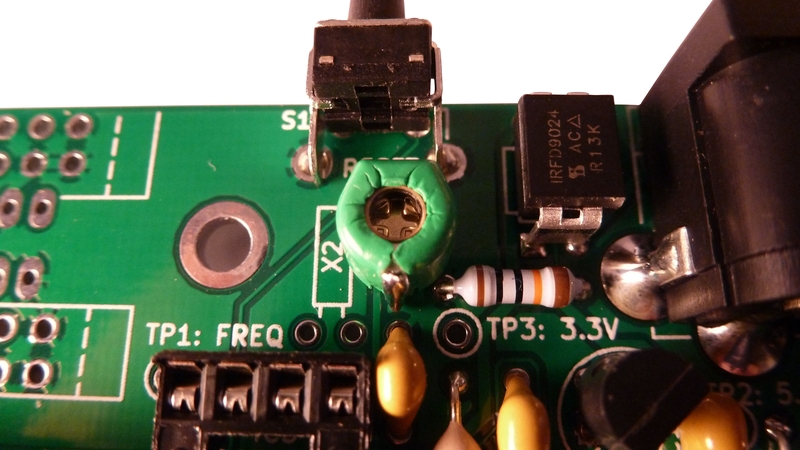 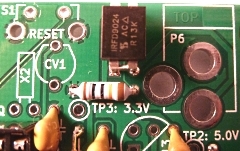 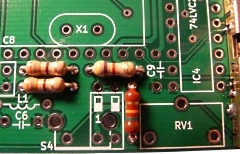 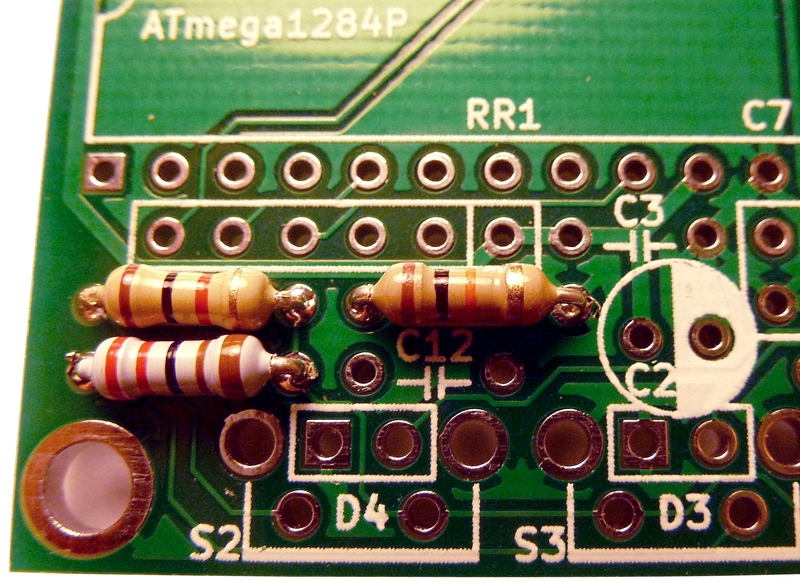 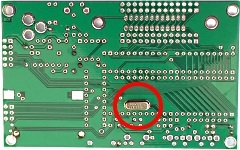 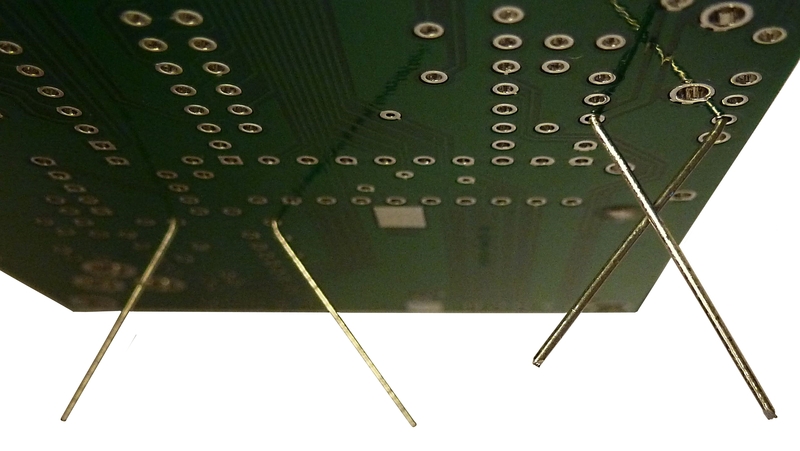 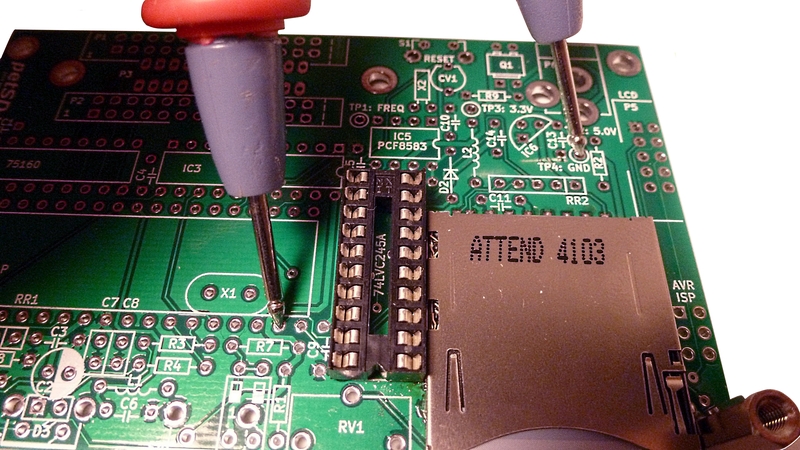 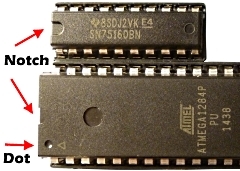 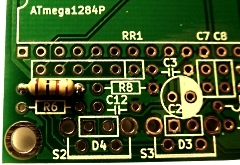 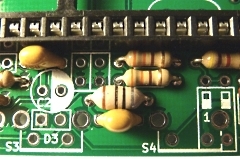 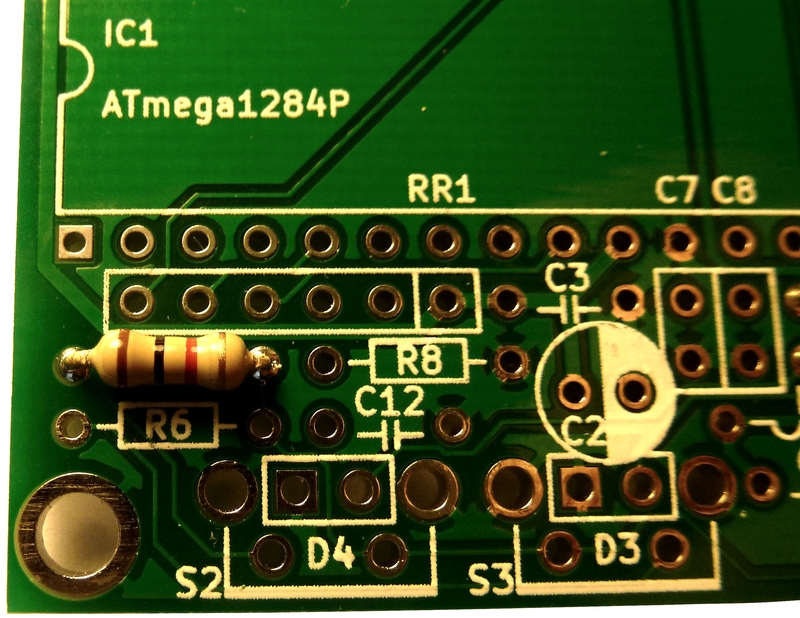 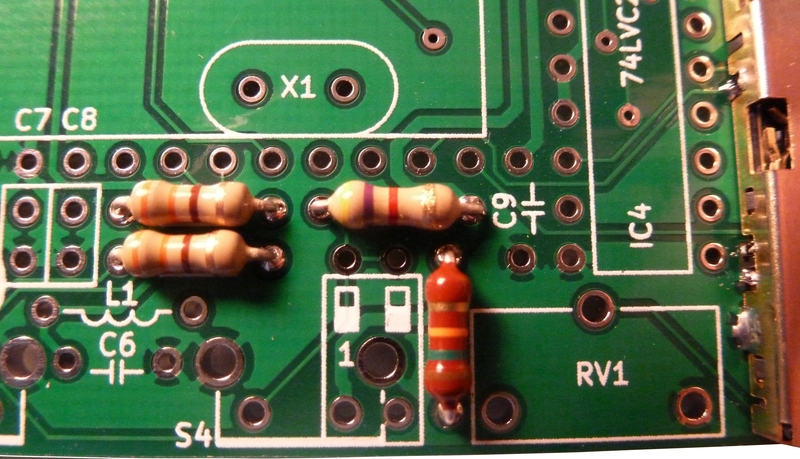 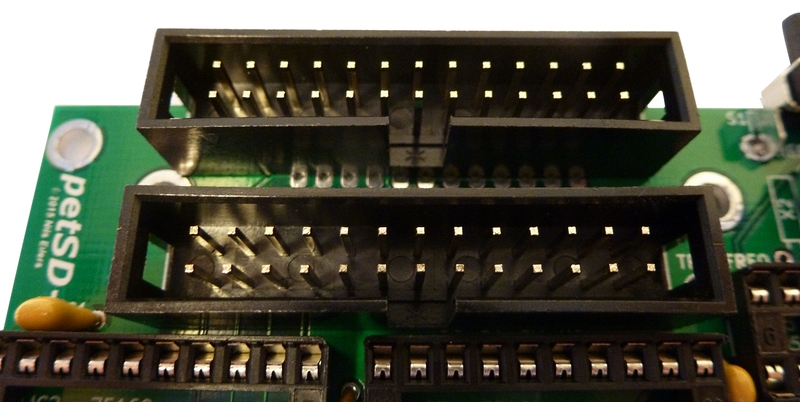 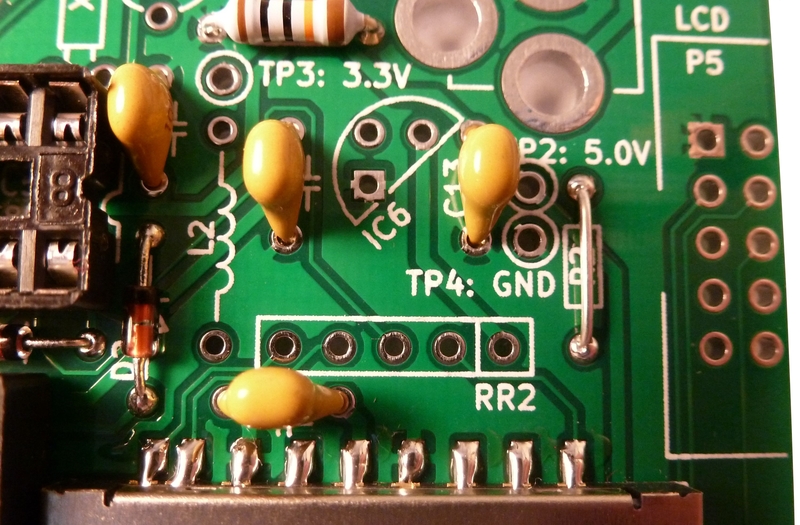 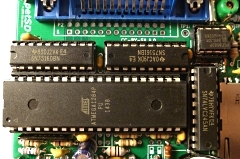 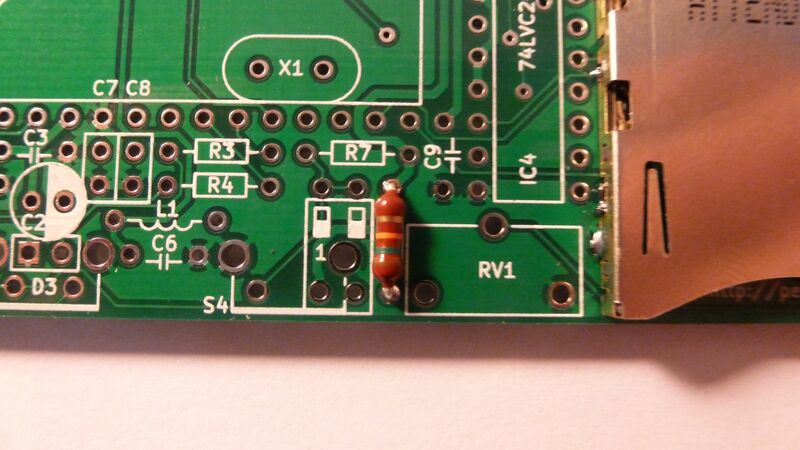 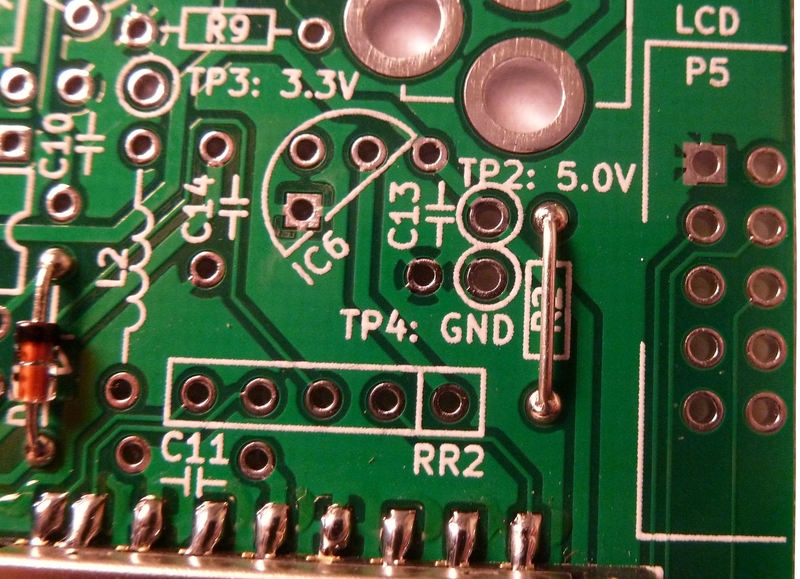 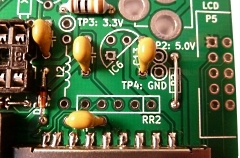 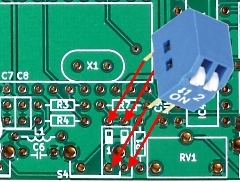 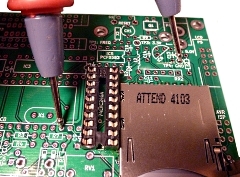 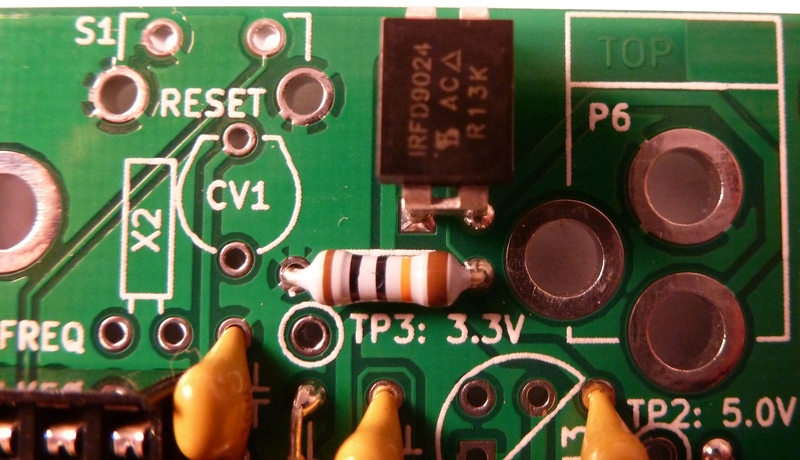 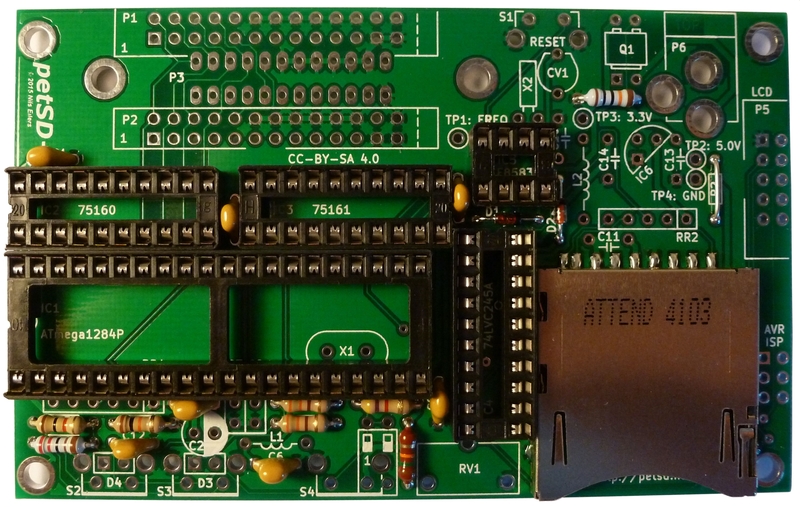 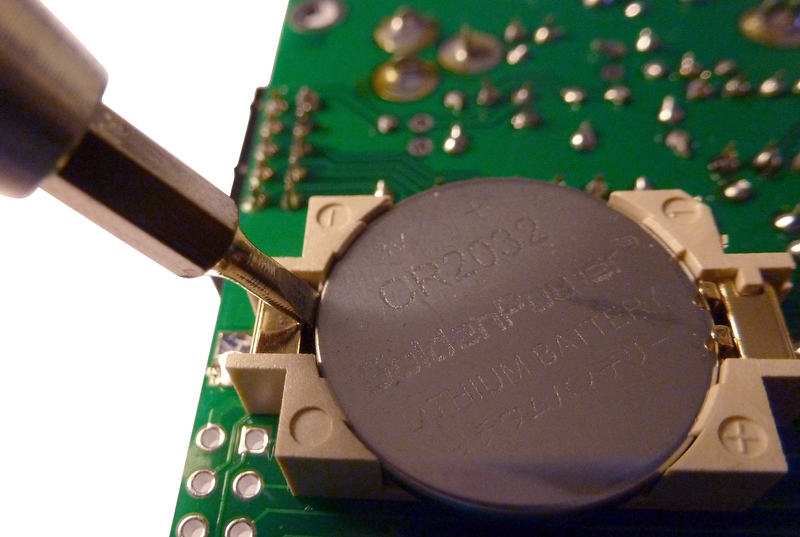 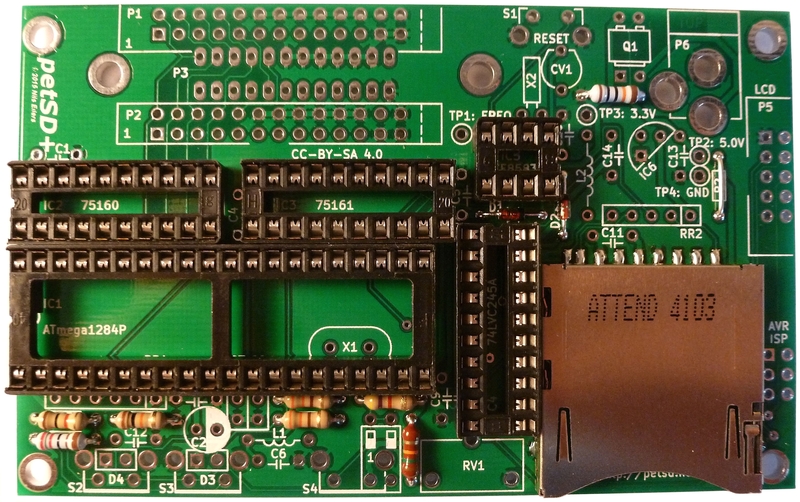 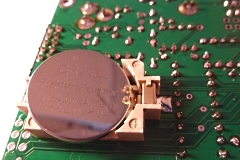 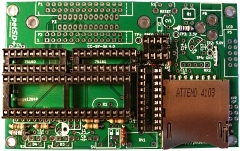 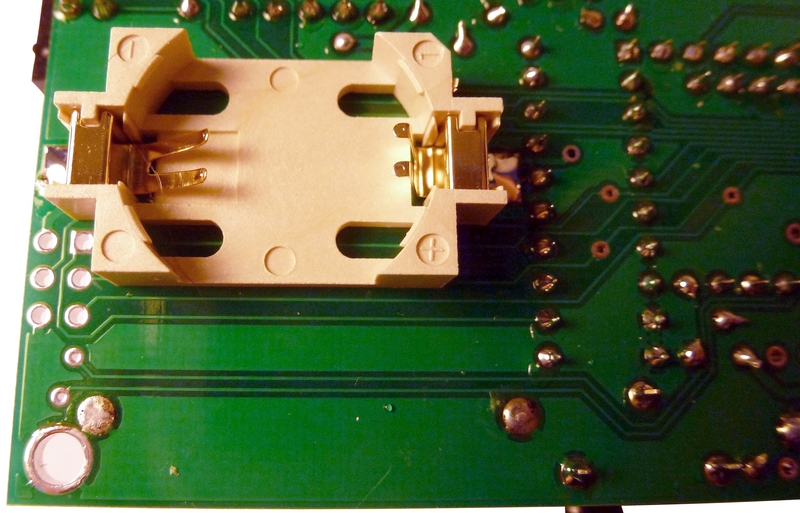 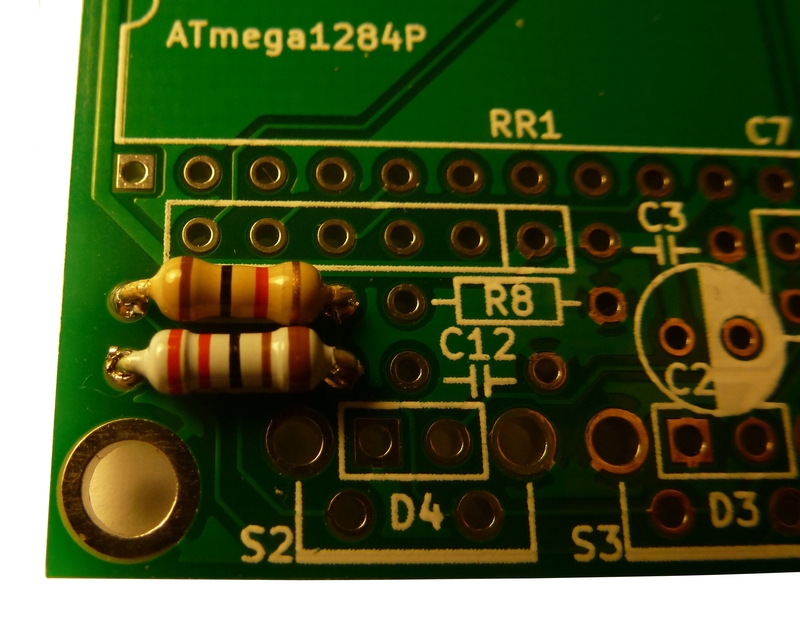 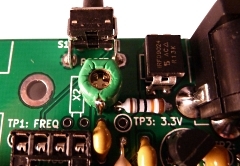 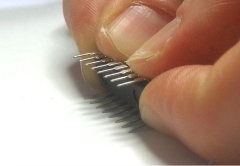 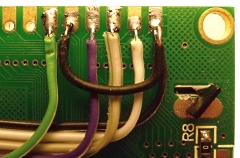 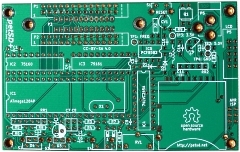 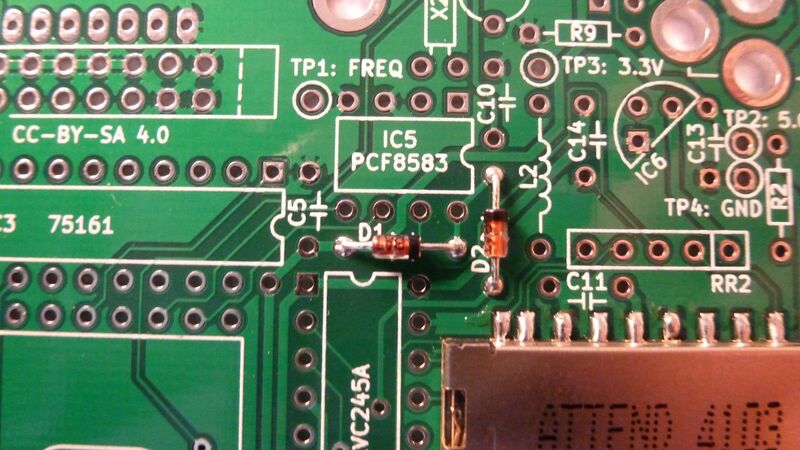 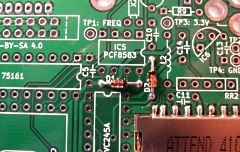 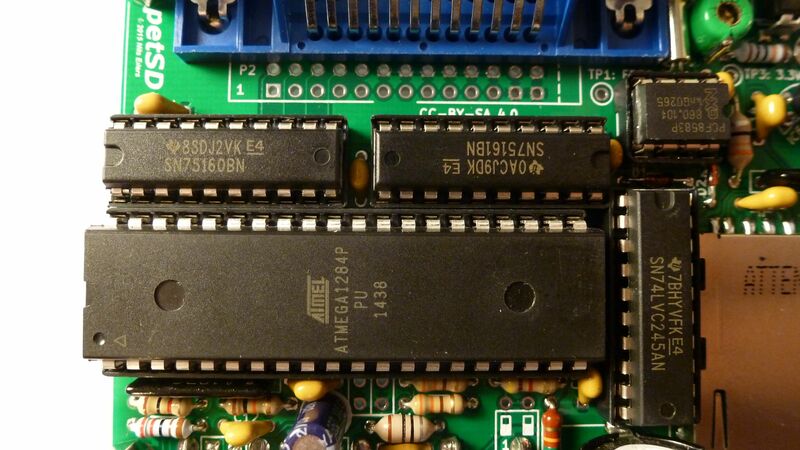 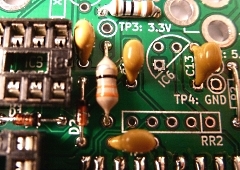 If the ISP connector is added, you will need to cut the track from IC4 pin 12 and connect pin 12 to pin 1 on the ISP connector via a 680 ohm resistor (R10) on the underside of the board as shown in the photo. 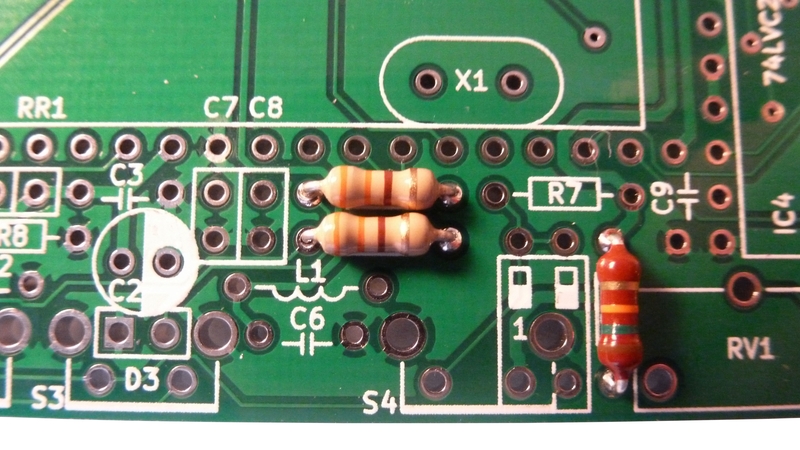 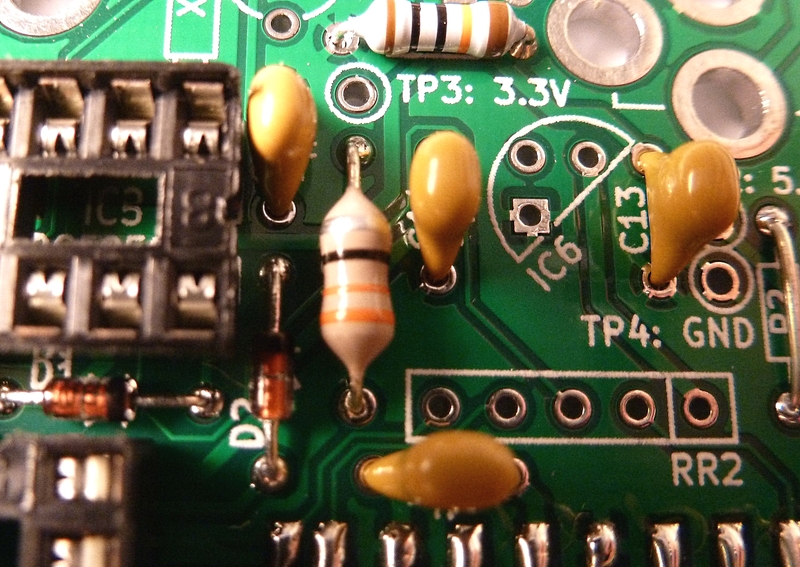 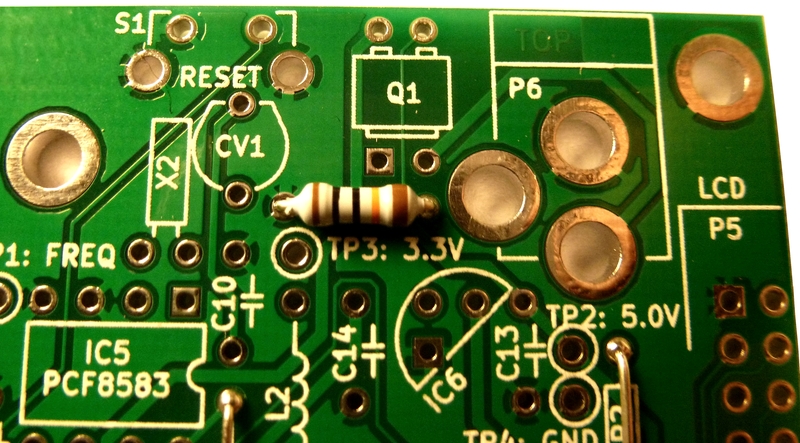 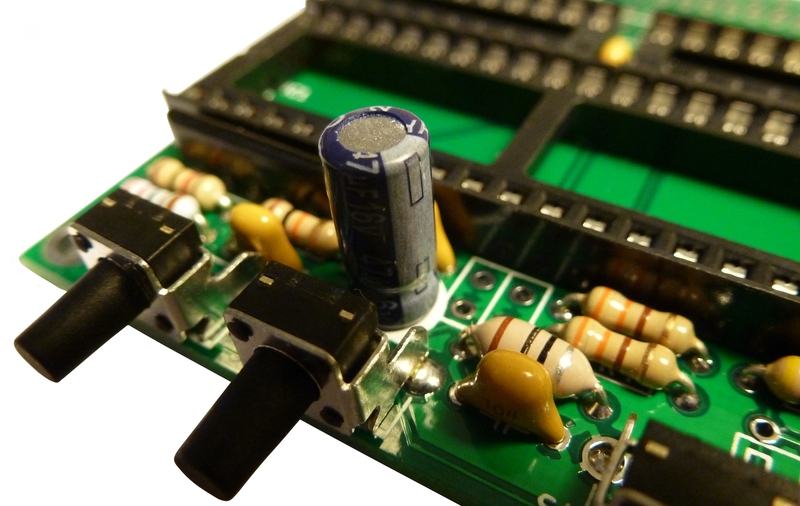 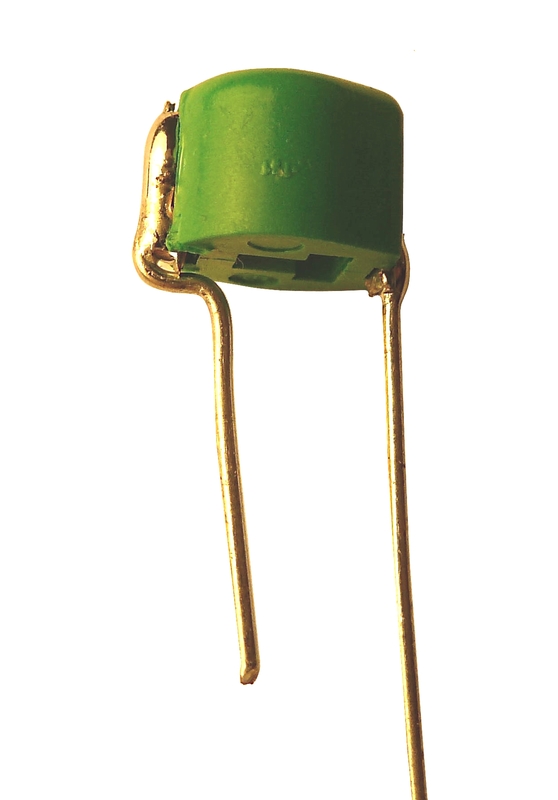 C12 This capacitor was intended to smooth the voltage generated by the option buttons to help de-bounce the circuit. 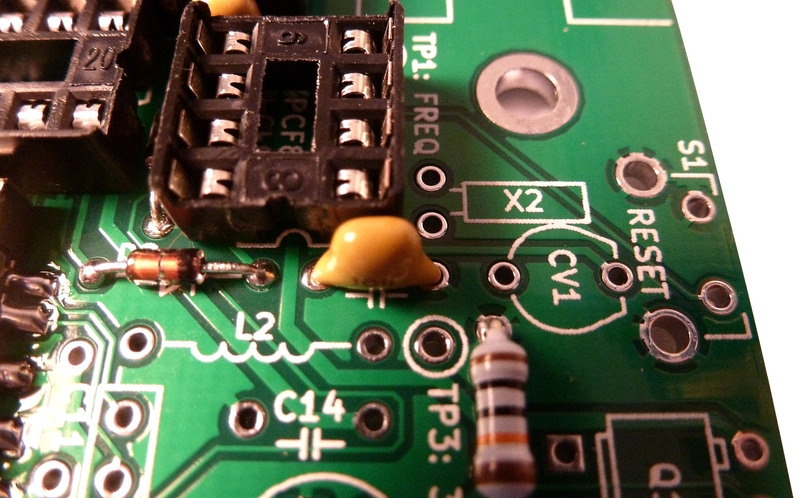 However, it turns out that C12 is more of a liability than a help and should be removed. Provided that you have some basic tools, removal of C12 is straightforward. As C12 is located behind the PREV button, if the LCD screen is fitted it should be temporarily disconnected to allow C12 to be removed. 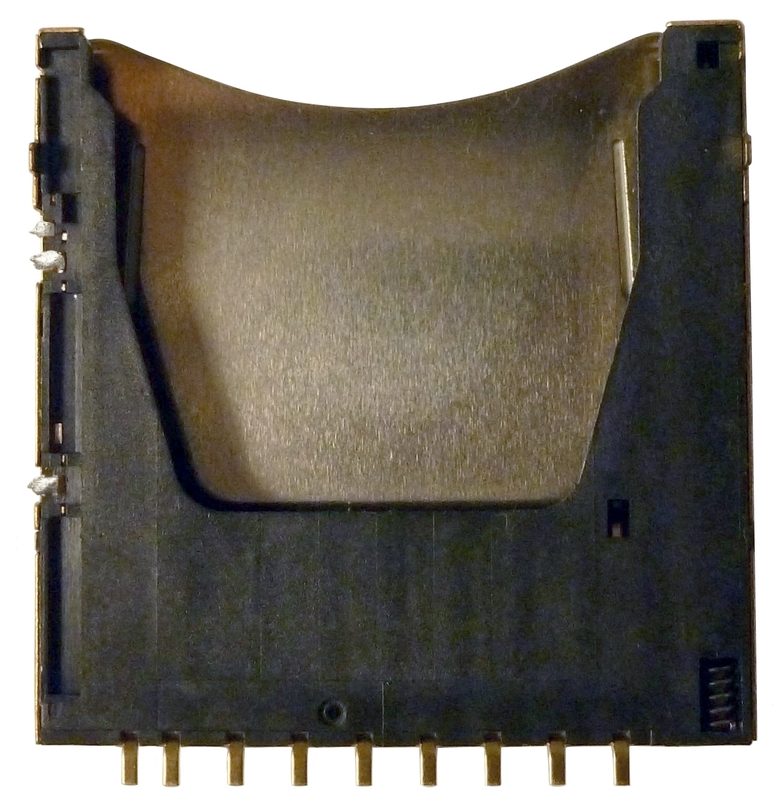 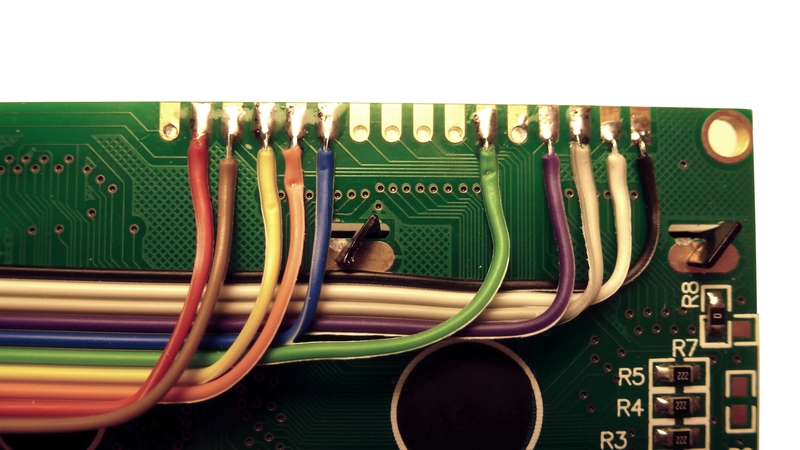 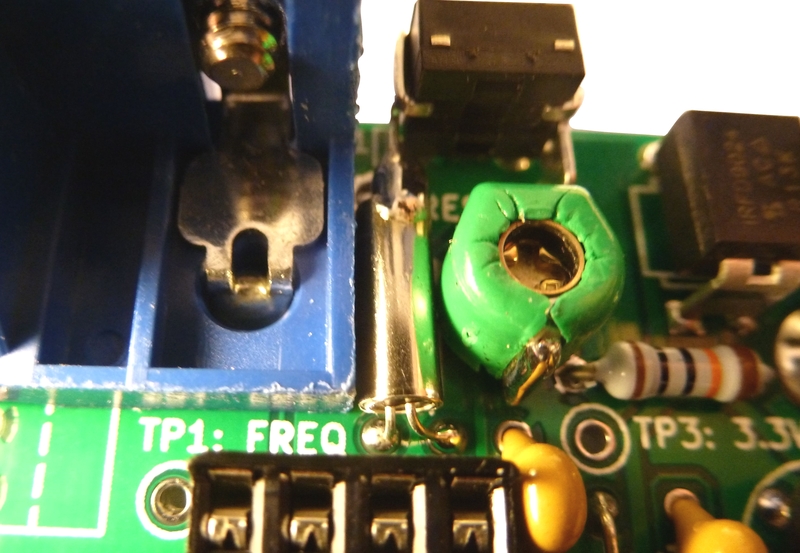 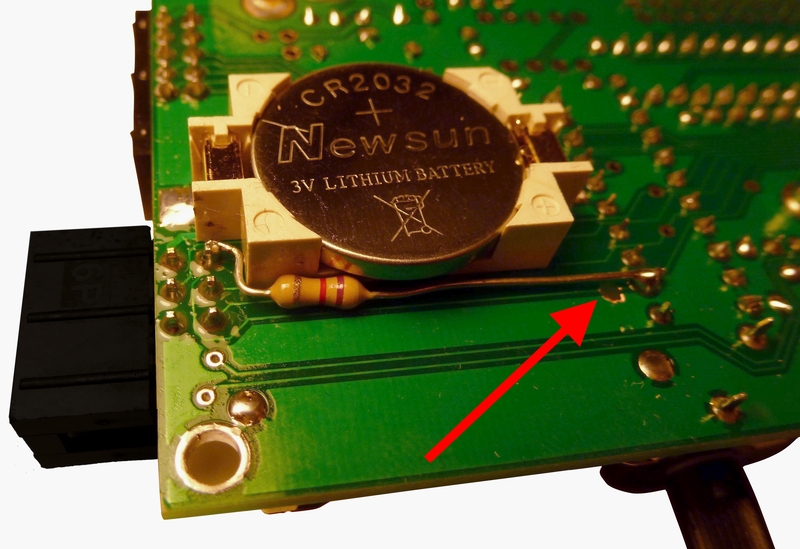 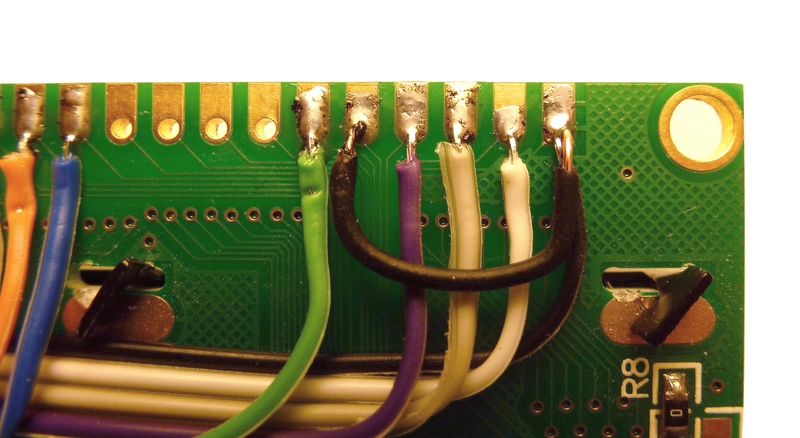 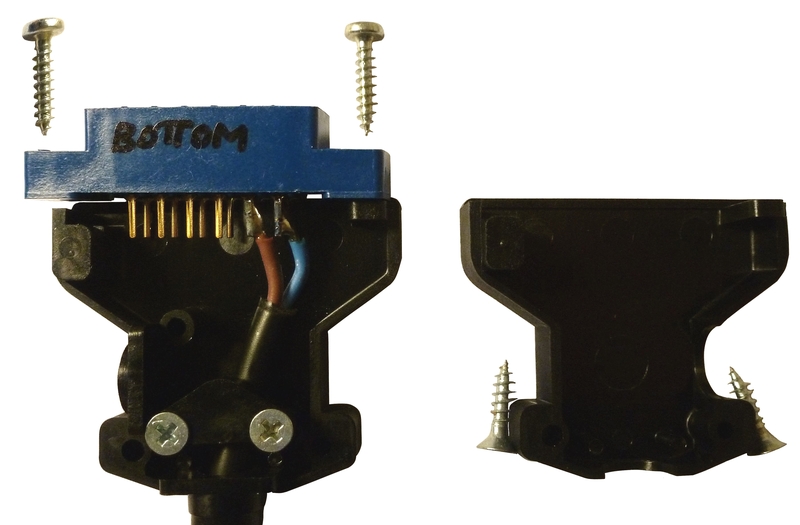 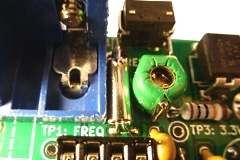 Caution : As the clearance between the LCD and petSD+ PCB is quite tight, the LCD connector plug does not have any strain relief on the cable - carefully remove the plug by pulling on the edges of the plug - do not pull on the ribbon cable, you will almost certainly ruin it. 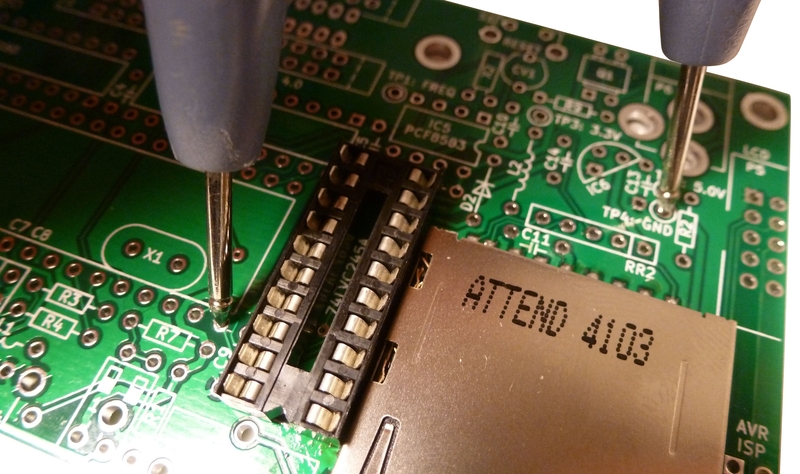 Provided that you have a soldering iron and even basic skills with using it, C12 can be de-soldered without too much difficulty. Alternatively, you can just remove it by cutting its legs with fine point snips. 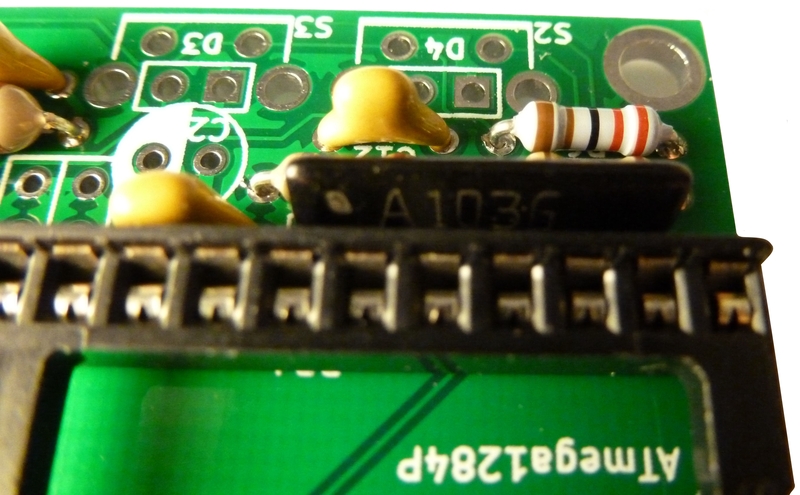 If you would have difficulty in doing this yourself, drop me an e-mail and we can try and work something out.